Figure 10.14 A dump ridge and an associated ice-marginal band of hummocky topography in central Minnesota. A) Figure of a portion of the Spider Lake and Bungo Creek, Minnesota 7.5' topographic quadrangles, (USGS), contour interval 10 ft. The outwash plain at the left edge of the map is composed of outwash derived from an esker tube to the north of this map. 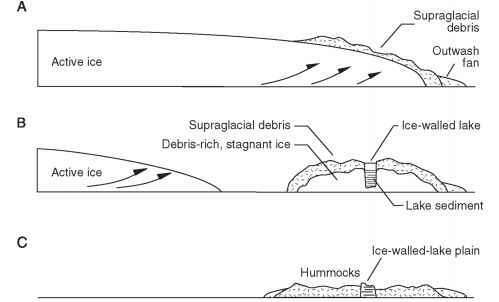 B) and C) Hypothetical cross sections showing the ice of the Superior Lobe with thrust planes rich in debris melting out on the ice surface, and eventually forming the hummocks, dump ridge and icewalled-lake plains. supraglacial positions as the ice melts. Critique of the supraglacial model (Gravenor and Kupsch, 1959; Munro and Shaw, 1997; Eyles et al., 1999b; Boone and Eyles, 2001) is founded on the supposition that it is difficult to transport enough debris to the ice surface from a subglacial position. Furthermore, these authors point out that supraglacial debris on modern glaciers has quite different characteristics from basal till, whereas much of the till in the landforms described in this chapter is essentially identical to the local basal till. Therefore, our model of the supraglacial landsystem must explain how sediment can get to the ice surface in the lowland setting and how it retains its basal characteristics. 3. by the subglacial incorporation of debris by freezing-on followed by thrusting or release by top-down melting. We consider these mechanisms sufficient to provide the supraglacial sediment necessary for the landforms we describe. Thrusting along shear planes at the ice margin can carry debris-rich basal ice and unfrozen subglacial debris to englacial positions, and this has been noted on modern glaciers in Greenland, Iceland and Svalbard (Swinzow, 1962; Boulton, 1967, 1970; Hambrey et al., 1999; Sletten et al., 2001; Lysa and Lenne, 2001). This thrusting mechanism has been used by several authors to explain abundant supraglacial debris on Pleistocene glaciers (Gravenor and Kupsch, 1959; Clayton, 1967; Moran et al., 1980; Ham and Attig, 1996; Bennett et al., 1998; Fig. 10.3B). A striking example of this process is provided by St Onge and McMartin (1999) who describe buried extant Late-Wisconsin glacier ice underlying abundant supraglacial till in the Northwest Territories, Canada. The remnant glacial ice is debris rich, which they interpret to have been generated by marginal thrusting and stacking. They point out that, with a future climate change, the melting of this ice and supraglacial debris would produce a hummocky topography. Sharp (1985) and Hambrey et al. (1996) noted that this thrusting process is accentuated with surging glaciers and can cause debris to be lifted to positions as high as 200 m above the ice bed. Furthermore, there are many examples of glacitectonically deformed bedrock where glaciers have actively moved subglacial material up into the ice (Aber et al., 1989; Moran et al., 1980). This material can be moved to englacial positions, be deformed by glacier flow and eventually melt-out on the ice surface. Stacking of debris-rich ice may also produce thick sequences of stagnant ice that later melt and generate abundant supraglacial debris. This may occur by the thrusting mechanism mentioned above, but also by glacier readvances or slight fluctuations of the ice margin in which active ice rides up over older, stagnant ice (Fig. 10.15C). Older ice may be reactivated (Eyles, 1983c; Sharp, 1985b) and incorporated into the active ice, bringing debris-rich ice to higher englacial positions. Because stagnant ice can remain for thousands of years following a glacier advance (Florin and Wright, 1969; Bose, 1995), it is not difficult for stagnant ice to become further buried by subsequent ice advances. Figure 10.15 Large tracts of hummocky topography do not necessarily mean widespread ice stagnation. 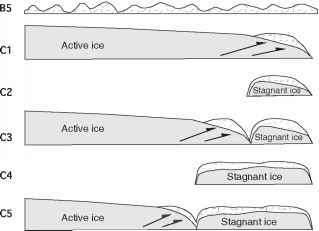 Here are three models for how active and stagnant ice can produce a large hummock tract. A) A large portion of the glacier is debris-covered and later stagnates in place to produce hummocky topography. This is a common interpretation for regions characterized by the supraglacial landsystem. However, we consider such a scenario unlikely. A similar suite of landforms can be produced by the mechanisms shown in B) and C). B) A marginal zone of ice is covered with debris brought from the glacier bed by thrusts, inhibiting melting and causing ice to stagnate and separate from the active ice. This marginal band of stagnant ice expands as the active-ice margin retreats. C) The debris-covered marginal zone is isolated as ice retreats (CI and C2). Ice readvances (C3) only to melt back again, leaving a debris-covered marginal zone. 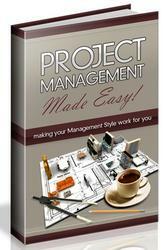 This process can be repeated several times. 3. surging glaciers (Clapperton, 1975; Sharp, 1985b; Clayton et al., 1985; Hambrey et al., 1996). Two or even all three of these mechanisms can act jointly. Additionally, surging ice lobes moving as plug flows can form levee-like accumulations of stagnant, debris-rich ice along their margins, which then melt out to form hummocks, as along the edges of the Des Moines Lobe in Minnesota and Iowa, USA (Kemmis et al., 1994). In addition to thrusting and stacking, the amount of englacial debris can increase by the freezing-on of subglacial material. This occurs on sub-polar glaciers where debris is frozen-on at the boundary between warm and cold ice near the ice margin (Boulton, 1972b). Sediment entrainment also occurs when supercooled subglacial water freezes-on near the ice margin (Evenson et al., 1999). Supercooled freezing-on occurs where there is a steep subglacial gradient near the ice margin, a condition that would have been present near the margins of several parts of the Pleistocene ice sheets. Additionally, surging glaciers may cause an increase in freezing-on of subglacial sediment, as suggested by Clapperton (1975) who noted that frozen-on basal debris was more common on glaciers in Iceland and Svalbard that had surged than those that had not. These observations indicate that sub-polar glaciers that surge or that flow against regional slopes are likely to have greater amounts of basal-debris-rich ice and englacial debris, which in turn can be readily carried to higher positions in the ice and eventually be released supraglacially. Pleistocene glaciers in lowland settings in North America and Europe matched these characteristics: they were sub-polar, based on climatic evidence (Black, 1976a and b; Attig et al., 1989; Boulton et al., 1995; Cutler et al., 2000), many of them surged, as shown by radiocarbon datings (Clayton et al., 1985), and many portions of the ice sheets flowed out of basins near the ice margin (e.g. the Winnipeg Lowland and Great Lakes region of North America and the Baltic basin of northern Europe). These observations support our contention that it is reasonable to explain these landforms in terms of abundant supraglacial debris. The supraglacial landscapes we have studied in Wisconsin and North Dakota formed during a time when permafrost was present around the margins of the existing glaciers, and we find hummocky terrains to be best developed at the outer margins of the Late Wisconsin ice advances, at a time when permafrost was present. During ice recession, permafrost would not have had time to develop as deeply as during ice advance, and this explains in part why there is less hummocky terrain associated with younger ice margins. However, hummocks present at younger margins indicate that factors other than permafrost were important in supraglacial debris genesis (Attig and Clayton, 1993). Though the presence of permafrost creates conditions that favour the incorporation of englacial debris and its transference to higher positions within the ice, it is not a requirement for the supraglacial landsystem. These mechanisms indicate why supraglacial till often looks like the regional basal till, because it is the regional basal till. That is, it is till derived from the base of the glacier and moved or frozen into englacial positions by the processes we outline above. The uppermost surface of the supraglacial debris will experience the sorting and winnowing commonly seen on modern glaciers, but these processes will not affect the entire thickness of supraglacial till thereby preserving the sedimentary characteristics produced englacially or at the glacier bed. Englacial debris is exposed on the surface due to ablation. Ablation causes downwasting and backwasting of the debris-rich or debris-covered ice (Kjsr and Krüger, 2001, Lysa and Lenne, 2001), the rate of which is controlled by climate, geothermal heat flow, meltwater drainage, and debris content in and on the ice. Several processes may occur on the debris-covered ice surface including flowage or sliding of debris, mechanical mixing of till with other supraglacial lake or stream sediment, frost action, winnowing of fines, concentration of clasts, and soil formation (Eyles, 1983c; Kjsr and Krüger, 2001). Supraglacial sediment may be resedimented several times during ablation (Boulton, 1968, 1972a; Clayton and Moran, 1974; Lawson, 1979; Sletten et al., 2001). As ice becomes more deeply buried beneath supraglacial debris, downwasting rates decrease and the remaining ice melts out slowly (Krüger and Kjsr, 2000, Sletten et al., 2001), often so slowly that the surface sediment becomes thick enough for vegetation to become established. As the supraglacial debris cover becomes thicker, the deeply buried portions of the supraglacial debris may escape extensive reworking and may produce melt-out till (Johnson et al., 1995) or experience only a few resedimentation episodes. Supraglacial lakes form on the surface and expand by melting downward and laterally with some marginal calving (Benn et al., 2000). Expanding lakes may coalesce with others. Drainage of meltwater will take advantage of weaknesses and crevasses in the stagnant ice and form sinkholes. The water level in these sinkholes will be controlled by the groundwater system in the glacier. As sinkholes grow, sedimentation by till flowage and lake processes will initially be rapid. The presence of permafrost will significantly slow the melting of buried ice (Driscoll, 1980), and may even affect geomorphic development of hummock tracts. For example, high-relief hummocks in northern Wisconsin (Fig. 10.2A) likely formed in two phases, with stable environment icewalled-lake plains (Fig. 10.12) forming first when extensive buried ice was maintained by regional permafrost (Fig. 10.16). With climate warming and melting of permafrost, the buried ice melted and the surrounding hummocks formed by supraglacial collapse (Ham and Attig, 1996). A rare modern analogue for this model exists today in Siberia where ice-walled lakes occur in extant Late Weichselian glacial ice, maintained by permafrost (Alexandersson et al., 2002; see also Chapter 7). With a climate warming, the melting of ice would produce ice-walled-lake plains surrounded by hummocks. Additionally, if permafrost slows the melt rate of stagnant, debris-covered ice, more melt-out till may be produced because slow drainage and slow ice melt would lessen the number of flow-till events (Eyles, 1983c). 10.3.4 Marginal or Widespread Stagnation? Figure 10.16 Two-step formation of hummocky topography in northern Wisconsin controlled by permafrost. A) Supraglacial debris accumulates in the marginal zone of a glacier. B) Ice retreats, but supraglacial debris and permafrost insulate and preserve much of the stagnant ice. Ice-walled lakes form, perhaps melting to the bottom of the stagnant ice. C) With the abatement of permafrost, the remaining stagnant ice collapses producing hummocks. Note outwash fans on both the proximal and distal sides of the hummock tract. (From Ham and Attig, 1997). with specific ice-margin positions (e.g. Gravenor and Kupsch, 1959; Evans, 2000b). Such large regions have been traditionally interpreted to result from widespread, regional, en-masse stagnation (Parizek, 1969; Flint, 1971; Fig. 10.15A). 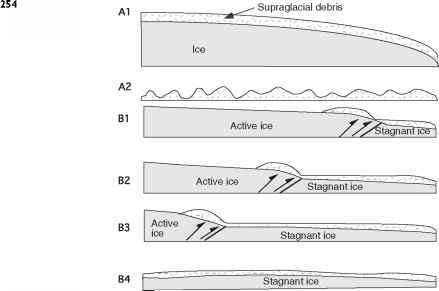 However, progressive development of stagnation zones during overall retreat may produce a broad area of stagnant-ice deposits that may be misinterpreted as widespread, regional stagnation, when it actually represents a style of active-ice retreat or the stagnant ice from several advances (Figs. 10.15B and C). Incremental, marginal stagnation is described by Dyke and Savelle (2000) for a group of presently ice-cored Younger Dryas moraines on Victoria Island, northern Canada. They point out that if permafrost were to leave this area, the ice cores would melt, and the now well-defined ridges would be transformed into a chaotic hummocky landscape, leaving the landscape to appear no different from landscapes interpreted to have formed by widespread regional stagnation (see also Chapter 7). Additionally, Hambrey et al. (1997) and Bennett et al. 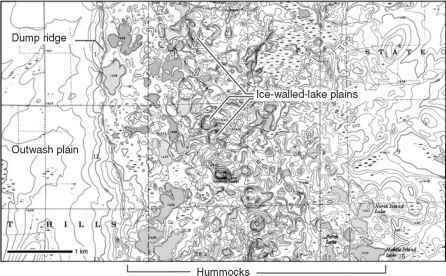 (1998) describe hummocky landscapes produced from actively receding ice during which supraglacial debris (brought to englacial and supraglacial positions through thrusting) is slowly let down. Considering that marginal processes (thrusting, stacking, and freezing-on) are the processes we believe to generate much supraglacial debris, we regard widespread regional stagnation (Fig. 10.15A) as unlikely and suggest that most large hummock tracts result from the scenarios shown in Fig. 10.15B and C.
A key dimension of glacial research in the past 30 years has been the attention paid to modern glaciers as providing modern analogues for Pleistocene sediment and landforms (Boulton, 1972a). As essential as this research is, we point out that there are still many Pleistocene features that lack modern analogues, and that landforms of the supraglacial landsystem are among them. Though the formation of hummocky topography has been noted on modern glaciers (Boulton, 1967, 1972a; Eyles, 1979, 1983c; Wright, 1980; Sharp, 1985b; Krüger, 1994a; Krüger and Kjsr, 2000; Sletten et al., 2001), none of these field studies note hummocks with the relief or internal structure of many Pleistocene hummocks. 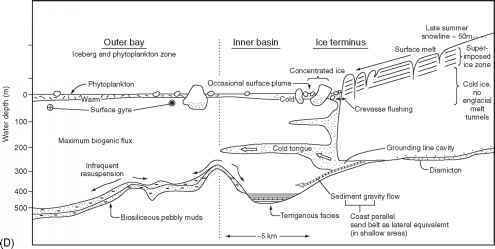 Descriptions of modern glacial-sinkhole deposits and the behaviour of modern supraglacial lakes (Rubulis, 1983; Benn et al., 2000) bear little resemblance to the ice-walled-lake plains we describe. Additionally, the thickness of supraglacial debris described on modern glaciers (Boulton, 1968, 1972a; Lawson, 1979; Kjsr and Krüger, 2001) is insignificant compared with the likely few tens of metres for the till hummocks of North America (Clayton, 1967). Though any model needs to be supported by careful fieldwork with description of geomorphology and sedimentology, it is clear that glacial geologists should not be restricted to models developed solely on modern glaciers.